McDonald's only just announced that it's going to be appeasing our insatiable desire for the flesh of beasts with new breakfast sandwiches, which are basically the old sandwiches stacked even higher. And on Thursday, only a day later, McDonald's has announced yet another big piece of big meat news: The McRib is back. The on-again, off-again marriage of rib and bread is gracing McDonald's menu once again. According to a press release, the sandwich will appear at 9,000 restaurants nationwide, and you can even get it delivered now. 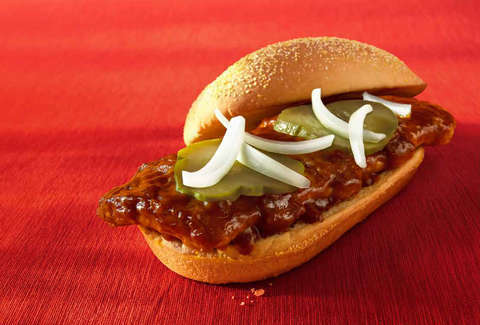 In case you're unfamiliar, the McRib appears at random intervals to teach us valuable life lessons and is also a sandwich that features boneless pork with barbecue sauce, slivered onions, and pickles on a hoagie bun. The last time it came around was November 2017. If you're looking to find a McRib near you, you can download the McDonald's Finder app, which will lead you to locations that stock the sandwich. You can also find participating restaurants on the Uber Eats app, and that location will deliver the McRib to your place of residence, affording you the privacy to catch up with your long-lost friend. It'll only be around for a limited time, but we're sure it'll be back again someday.